Today we are going to be talking on how to install xampp for windows so just follow the steps carefully. First on your web browser, visit the XAMPP website you can download any type of xampp version you want. Then quickly click on the download link for XAMPP. After being prompted for the download, click "Save" and wait for your download to finish. Install the program, and click on "Run" quickly on your computer. Accept the default settings. Then a quick command will open and offer an initial installation prompt. Now press the Enter button on your keyboard, and accept the default settings. After your installation is complete, exit the command window by typing x on the command line. Now Start the XAMPP Control Panel. Start the apache and MySQL components. You can also start the other components, if you plan to use them. Verify the Apache install, by clicking on the Apache administrative link in the Control Panel. Then Verify the MySQL installation, by clicking on the MySQL administrative link in the XAMPP Control Panel. 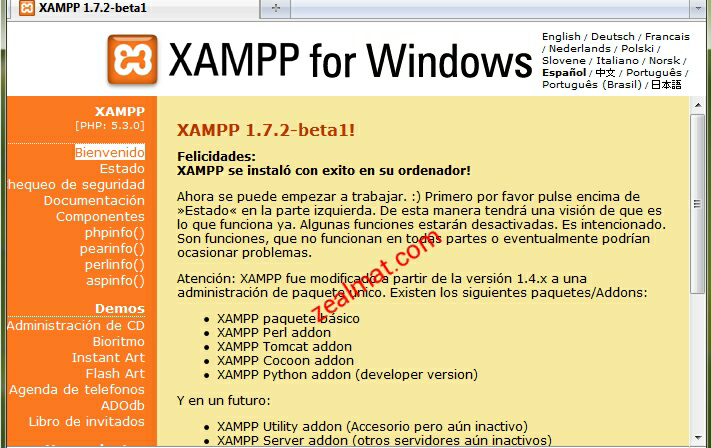 Finally the verification steps is successful, XAMPP should be successfully installed on your PC. Open a browser and enter "localhost" on your address bar. You will be redirected to a page telling you that you've successfully installed xampp on your system that's all you need.